Nathan married Keyestine in 2001 and they have lived on the farm ever since. They have 3 children Meadow, Matisse and Levi. Nathan became the company director in 2007 and has introduced many new products and ideas to the company. 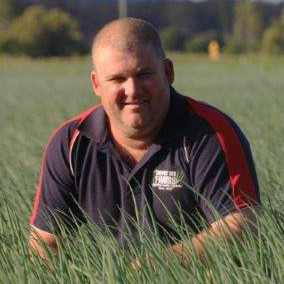 Broccolini and shallots have been very successful for Campsey Ash Farms and we are now one of the largest Spring Onion growers in Australia. Nathan is always looking for new and exciting ideas for Campsey Ash Farms and continuing the company’s growth. Nathan and Keyestine have built many successful partnerships with other companies across the country over the last few years and are supplying every big retailer in Australia with fresh produce.